Charges against Abd al-Rahim al-Nashiri dropped "without prejudice"
(CNN) -- The U.S. government has dropped charges against Abd al-Rahim al-Nashiri, the suspect in the bombing of the destroyer USS Cole, according to a Pentagon spokesman. 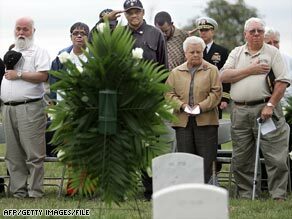 Parents and friends at the funeral in 2000 for a sailor killed during the bombing of the USS Cole. The charges were dropped "without prejudice" by Susan Crawford, convening authority at the U.S. prison camp at Guantanamo Bay, Cuba, according to Pentagon spokesman Cmdr. Jeffrey Gordon. The proceeding did not address specifics of the government's case against al-Nashiri, who remains a "high value" detainee held at Guantanamo. In removing the charges without prejudice, prosecutors can resubmit charges at a later date while at the same time complying with President Barack Obama's order to the military to hold off on cases for four months. On his first day in office, Obama ordered the halt, requiring prosecutors to seek delays in the 14 active cases before military commissions there. But the judge, Col. James Pohl, ordered arraignment for Abd al-Rahim al-Nashiri to go ahead as scheduled on Monday. With this move, all cases at Guantanamo are now in line with the president's order to halt court proceedings at the detention center, according to Gordon. Al-Nashiri is accused of planning the October 2000 bombing of the Cole while it was in the Yemeni port of Aden. The attack killed 17 American sailors and crippled the vessel, which returned to service in 2002. The Office of Military Commissions, which manages the prosecutions of suspected terrorists, said last week that it might have to temporarily drop charges against al-Nashiri to comply with the presidential order. When prosecutors asked for a continuance in the trial, Pohl denied the request, saying the government's "argument for continuances were unpersuasive," according to a copy of his opinion. Pohl noted there had been no previous requests for a delay, and that the public's interest in a speedy trial would be harmed by further delay. Al-Nashiri was captured in 2002. He was held in secret locations until being transferred to Guantanamo Bay in 2006. Meanwhile, the White House has invited families of sailors who died in the Cole bombing to meet with Obama on Friday. A number of the families were called Thursday afternoon, according to Andrew Hall, the lawyer who represented families. The invitation was for the families to attend "without their lawyers," according to Hall. They were not told why they were going to meet with Obama, he added. According to the White House schedule for Friday, Obama will meet privately with families of the Cole attack and also with families of victims of the 9/11 attacks. "The president wants to talk with these families about resolving the issues involved with closing Guantanamo Bay -- while keeping the safety and security of the American people as his top priority," the schedule said.